"Thanks for your support" and "see you next year" scrolls around the screens at the top of the O2. Another successful tournament, another confirmation of Novak Djokovic's preeminence. Now, thoughts turn to next weekend. Great Britain aiming to end 79 years of Davis Cup hurt. Novak Djokovic poses with the ball kids and the trophy, sparking a rush from the blue-shirted fuzz-grabbers to get a prime position close to the centre of the shot and the main man. After the snappers have done their work, Djokovic slaps high-fives with the ball-kids. Novak Djokovic's turn. The Serb hoists the trophy to the roof as the blue and white tickertape flutters down around him. "I am enjoying every moment on the court,I cherish every moment after dreaming of it as a kid. Thank you everyone for making this year so special," he says. "I am looking forward to our two weeks of holiday with my wife and son and away from tennis for a bit. Congratulations to Roger, it was another epic match today and I hope you enjoy your time off with your family." Slightly surreal choice of backing track as Djokovic lifts the trophy - 'Fix You' by Coldplay. Perhaps the words are aimed at the beaten Federer - "When you try your best and you don't succeed..."
Roger Federer steps up to press the flesh with the dignitaries and pick up the runners-up plate. "It is never fun on the not winning side, it is better than not playing at all like last year," he said. "This week was great, there were some crazy points tonight, but like plenty of times this year Novak deserved it. Well done on a crazy good year." This tournament is a big money-spinner for the ATP who generate north of £10m from the event. It is also where the players put some serious bread on the table. Djokovic will take home $2,061,000 (£1.35m) from his week's work. Federer's failure to win the title here means that Andy Murray will finish the year as world number two - his best ever ranking at the season's end. Novak Djokovic the statesman takes over from Novak Djokovic the cold-blooded competitor. The winner shares a sporting word with Roger Federer at the net before heading over to his camp to share an embrace with Boris Becker and the rest of his coaching team and a kiss with wife Jelena. Djokovic is the first man to win the year-end finals four years in succession. He has won five in total, one behind Federer. Federer saves the first break point. But double faults on the second! Job's a good un for Novak! Roger Federer surrenders the first point of the game with a lax forehand bosh between the tramlines. A massive trade of backhands in the next rally, Djokovic pushing right up to the baseline and Federer flops the 32nd stroke into the net. Djokovic just wide with a forehand as he goes for the kill. 15-30. Federer stabs a volley into the net! Two match points Djoko! If Novak Djokovic was unsettled by the three break points that slipped away from him in the previous game, he is hiding it well. A hold to love, sealed with a backhand plugged down the narrow slice of court that proves too good for a wrong-footed Roger Federer. Federer has to serve to stay in the match. This is going to test Djokovic's composure. He's not going to play many games like that and lose. Now ... engagement from the crowd - love, even - for Federer. Roger Federer channels Houdini and makes a supreme escape. Five straight points bring him back from the dead and bring the O2 Arena alive. Some demons floating over the net toward Novak Djokovic, looking to worm their way into his psyche. Novak Djokovic with a skidding, flashing, unerring forehand pass and Federer flops like freshly landed trout as his opponent moves to 0-30. A laser-guided forehand down the line and it is 0-40, three break points and, quite possibly, the beginning of the end. Roger Federer brings his many fans to their feet as he leaps like a salmon to swat away an overhead and win a game of cat and mouse at the net. The Fed Head lap that sort of thing up and the man himself celebrates with a clenched fist and long look down the other end. But Novak Djokovic slams a lid back on the bubbling atmosphere sharply. He works Federer over from the back of the court to bring up 40-15 and then lands a precision second serve down the middle which Federer never recovers from in the final rally. Roger Federer's serve has not been shoved under the spotlight particularly in this second set. He breezes through another thanks to some brave raids to the net and some fairly basic errors from Novak Djokovic. Is that a platform for him to get back into the match? It is a start certainly. It's almost as though the task is that much clearer for Federer. He is clearly trying to get to the net and force things,but Djokovic is so hard to break down. That's why he's number one. Roger Federer over-cooks a forehand over the back to allow 30-15 to slip to 40-15. Novak Djokovic advances to occupy mid-court and boss the rally, thumping down smashes with nail-gun power. Roger Federer's racquet crumples under the assault and Novak Djokovic keeps his nose ahead in the second set. Roger Federer keeps hold of his serve, despite one forehand return winner from Novak Djokovic that frankly required some sort of ESP/mind-reading/fortune-telling from the Serb. He was moving to hit the ball halfway though the ball toss. Former Arsenal legend Thierry Henry is in the crowd tonight. As are Gunners former and present Robert Pires and Olivier Giroud. Their side lost to West Brom yesterday, while Spurs beat West Ham 4-1 a little earlier. Roger Federer biffs a lovely backhand down the line - no backlift, just using Novak Djokovic's pace to redirect the ball for a winner. He then clambers into a high bounce on his own baseline and slaps away a forehand winner that registers 95mph on the speed gun. Two fabulous shots, but that is what Federer needs to do to get anything on the board. He loses the game to 30. Roger Federer holds serve as the match migrates from BBC Two to BBC Three. If you were watching on television you might have lost some of the detail in how he did so. Not if you watched via the feed at the top of this page though. Roger Federer is not going to go down wondering. He is trying to snuff out the rallies before they have time to get beyond three shots - the territory that Djokovic owns in men's tennis. However the Swiss is just wide as he goes for broke on a second-serve return at 0-15 up. Then at 40-30 down, he guesses, like a goalkeeper in a shoot-out, on the direction of Djokovic's second serve. He goes wide, but Djoko and the ball go down the T.
Roger Federer is 22-21 up in games against Novak Djokovic. But only one of those wins has come when he lost the first set. He saved break point and then broke Roger twice. He just needs more of the same. No surprise for guessing how Roger Federer plays the big points. He comes marching forward to the front of the court on both. The first time it pays off and a twisting backhand volley is too quick for Djokovic to rearrange his limbs into position to hit a winner. The second time it doesn't. Djokovic sticks up the lob, gobbles up Federer's stretching reply and moves a set up. You do know we get chocolates if Novak Djokovic wins. It's a tradition. He brings them out at the press conference. Novak Djokovic turns another service game into a non-event and that is just how he will like it. He runs 30-0 up the flagpole. He then rains down angles and spiteful pace off the floor in the next rally, but tugs a forehand wide. Almost a carbon-copy of the error, again missing by a foot or so out wide off the forehand wing, gives Federer 30-30. A jumbo-sized serve though, followed by a backhand swept down the line, pours a bucket of cold water on the rising fervour in the O2. Margaret Baker: Can you help pls Why has Roger got odd socks on? Right one has white stripe on the top?? This man is not for turning. Roger Federer keeps the faith in his net-pressing, advancing to slot away a nice backhand volley and then a running drive forehand to see off the danger from 30-30. Another opportunity slides by for Roger Federer, who found that he could not convert his chances against Djokovic in a four-set defeat in the US Open final earlier this year. Will it be another rare case of what-could-have-been for the man who has won so much? Roger Federer comes rushing to the net as Djokovic is forced out wide and sticks a volley mid-court and central. Djokovic should punish it, but flays wide, perhaps thrown by Federer's slightly shoddy stroke. Break point. Saved by Djokovic. Out of the fire and back to deuce. Novak Djokovic yanks a double-handed backhand, under no pressure, into the top of the net. It should have been a simple rallying shot. Instead it is 0-30 and a chance for Federer. Djokovic irons out those groundstroke gremlins as he pounds his way back to 40-30, but then is pinned by a dismissive backhand swipe down the line. Better news for Roger Federer as he ties down a serve game to love with some sturdy backcourt hitting. Novak Djokovic, as he has a few times this week, looks like he has taken a return game off after securing a break. A mental freshen-up to reward himself for his efforts. The keys for Federer always looked likely to be break-point conversion, which he struggled with in their US Open final, and success at the net, which took him past Wawrinka in the semis. So far the Swiss has failed to convert an early break point and come up empty on two trips to the net, Which does not bode well. Playing Novak Djokovic gets into other players' heads. They try a little too hard, push the limits beyond snapping point, stress-test their own games to destruction. Roger Federer looks like he has a little of the fever. He gets over-eager and slaps a second-serve return into the net for 30-0. He nibbles back a couple of points. But it is too much ground to make up. It's the fans with the Serbian flags - who are outnumbered here - that are happiest. Their man has had marginally the better of it, but a break of serve is worth its weight in gold. On BBC Radio 5 live Sports Extra. Playing Novak Djokovic is like hitting the ball against a brick wall as a kid. The harder you hit it, the harder it comes back. The better your angle, the more acute the return fire. The Serbian hardman wears down Federer and takes the first break of the match. Novak Djokovic scurrying like a crab on caffeine. The Serb runs down a little drop volley and slaps a forehand hard. Federer cannot keep it in play and is up against the rough side of 15-30. An 18-shot rally follows. Federer defending hard, fetching from the margins, shuttling running on the baseline. And Djokovic pumps a shade long. Oh my. Djokovic with a sublime lifted backhand angle. Sumptuous. And another break point. Novak Djokovic comes through with some spicy serving. Both men facing break points on their opening service games though. A groan from the crowd. Federer's return has failed to clear the gauze and we are to deuce. Roger Federer finding a nice forehand angle, thanks to some vicious topspin, to win a point and bring up 30-15. Novak Djokovic tries to up the aggro and prevent his man getting such an easy play on the ball. And sprays wide. Djokovic slaps wide once more and Federer has a break point, just like the one he saved in the opening game. Piyal: I feel Roger Federer will win this. I don't know why but I feel he will he will just sneak it here. This should be a cracker!!! Charlene Beedie: I honestly believe Novak Djokovic can finally win all 4 slams next year. With a good rest, he will bring good form again for 2016. John O: No doubt with who the crowd are supporting - Federer. 'Lets go Roger lets go' I hear. Roger Federer survives unscathed, but it was the closest shave that the stubbly Swiss number one has had all week. Novak Djokovic looks like he wants to bring the shock and awe of his A-game early doors. Roger Federer knows straight away that he has been dragged into a right old streetfight of a match. From 30-15 he is suckered into a couple of grinding rallies against Djokovic and that is not a place that he wants to be. Right, Roger Federer to get us going. Speaking of which (we don't just throw this stuff together you know) check out eight of the top photos of the week from the tennis showdown. Right here. Financial security. Super-strength sporting genes. An impeccable wardrobe. Musical talent (ahem). And, as it turns out, above-average signed mementoes. Romeo Beckham was in the house yesterday and departed with a hat complete with a personal message from Rafael Nadal. Andy Murray, by the way, is currently sat in the world number two spot. The Scot has never finished a season as high. However he can't get too comfy in Novak Djokovic's slipstream. If Roger Federer wins tonight, he will leapfrog Murray in the rankings. End of story? Oh no. This little tussle could blow over into next weekend's Davis Cup final. Murray could then regain the year-end number two slot with victory in two live singles rubbers against Belgium or, less likely, victory in just one combined with a team win. This is the second successive year that Novak Djokovic and Roger Federer have won through to the finale of the World Tour Finals and the third time in four years. Federer was forced to withdraw from last year's final with a back problem around lunchtime on Sunday. So tournament organiser Chris Kermode got on the hotline to Murray Manor and persuaded Andy, who was in the middle of a game of Mario Kart, to hot-foot it over to the O2 for an exhibition 'superset' against Djokovic. Murray lost 8-5 to Djokovic before turning out in a doubles knockabout with Pat Cash, John McEnroe and Tim Henman. I don't think the round robin match (which Federer won) will have a lot of bearing. Djokovic's intensitiy levels went down in the second set. It's a great way for the tournament to come to a close this year. 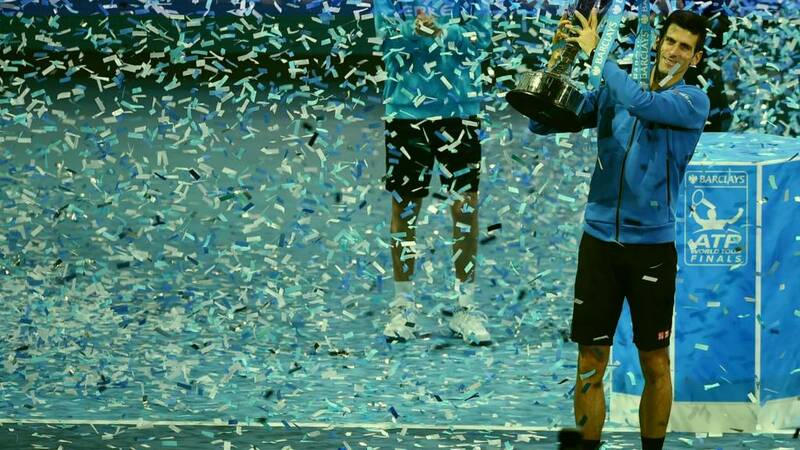 An image of Roger Federer striding along a backstage corridor appears on the big screen that hangs over the court sending a crackle of excitement rippling around the O2 Arena. He is greeted by a touch of Beatlemania as he emerges through the dry ice. Novak Djokovic comes off a little light on the decibel meter, but not by much. Cheryl Baker? Kriss Akabusi? On your marks. There is guaranteed record-rewriting tonight. If Novak Djokovic wins he will become the first player to win four straight season finale titles in the tournament’s 46-year history, surpassing Ivan Llendl who also won three on the bounce in the mid-eighties. If Roger Federer wins he will extend his own record of year-end tournament victories to seven. Djokovic and Federer (this is their 44th clash) have met the second-most times in the Open era. Their respective coaches, Boris Becker and Stefan Edberg, played against each other on 35 occasions. This match is coming at you every which way on the BBC this afternoon. First, the simple stuff. We have 5 live sports extra commentary, alongside the text on this page. Hit the play icon at the top to get it streaming in crystal-clear digital quality. We also have television coverage. It starts on BBC Two, but at 19:00 GMT it switches to BBC Three to make way for 'Robert Peston Goes Shopping'. Should be good. He recently got a pay rise so should ripe for a spree in menswear. To stick with the tennis without the channel-hopping, hit the play icon or live coverage tab at the top of this page. A first for Fed since 2012? The pair have met 43 times before, and Federer boasts one more victory. Every Superman has his kryptonite though. Novak Djokovic has never led Roger Federer in their head-to-head record. This season, Federer has beaten him three times, including a straight-sets dispatching earlier this week in the round-robin stages. With Stefan Edberg as part of his coaching group, Federer has remodelled his game, taking the fight to the baseline bruisers with regular raids to the net. Today, as with pretty much everywhere he plays, he will be backed by the majority of the crowd. He can draw on 27 Grand Slam finals for experience. And the aura that comes with being Roger Federer. Never mind the words, just look at the numbers. Novak Djokovic's 2011 season is widely regarded as one of the greatest in tennis history. He remained undefeated from the start of the season until the French Open semi-finals in June - a run of 41 matches. He collected three of the four Grand Slam titles and won 10 tournaments overall, picking up $12.6m in prize money. He finished the year with 70 wins and only six defeats. This season he has already amassed 81 wins to go with six defeats. He came within a French Open final defeat of winning all four Grand Slams. He is going for his 11th title today and has earned a cool $16.7m in prize money. This went beyond the usual press-room platitudes. "Novak for the moment is almost unbeatable. What he is doing is just amazing,"
"He's hitting amazing. The return is always amazing. This year he is serving great. And then he is able to play with no mistakes and changing directions so easy, playing so, so long. Who was getting giddy over the world number one? OnlyRafael Nadal,one of the all-time greats, left befuddled by Djokovic's brilliance in the wake of his 6-3 6-3 semi-final defeat by the Serb.